Artist's conception of the MAVEN spacecraft orbiting Mars. A NASA spacecraft that recently arrived in orbit around Mars is already helping to solve a Martian mystery. Scientists are using the space agency's Mars Atmosphere and Volatile Evolution (MAVEN) spacecraft to gather more data about how Mars' atmosphere bled molecules out into space over time. The agency released early results from the probe today (Dec. 15), showing how the continuous stream of particles emanating from the sun, called the solar wind, bury more deeply into the Martian atmosphere than scientists had previously thought. Scientists have thought that Mars lost much of its atmosphere through a process known as stripping, when the solar wind pushed a lighter isotope (type) of hydrogen out into space, leaving a heavier isotope called deuterium behind. As hydrogen escaped, the atmosphere thinned. This could account for why water stopped flowing on the Martian surface billions of years ago. 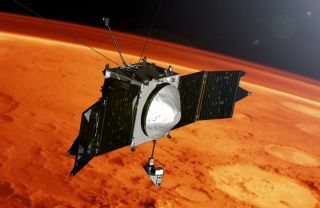 MAVEN began science observations in mid-November after a two-month commissioning phase briefly interrupted by Comet Siding Spring's close flyby of the Red Planet. To researchers' surprise, the spacecraft found solar-wind particles in the ionosphere, a region 75 to 300 miles (120 to 480 kilometers) above the surface that is known to shield the planet from the solar wind. Some particles, however, make it through. When the charged particles (known as ions) hit molecules in the upper atmosphere, the interactions make the particles neutral and allow them to move into lower altitudes, past the shield. More mysteriously, deeper in the atmosphere, these neutral particles re-emerge as ions again. By tracking these ions in the atmosphere, scientists think they can get more information about how the solar wind affected atmospheric loss over millions or billions of years on the Red Planet. Current ion loss is being measured by an instrument called STATIC (Suprathermal and Thermal Ion Composition), which saw a "polar plume of ions" around Mars shortly after it was activated. Other instruments on MAVEN are investigating the nature of the atmosphere more generally. The probe's neutral gas and ion mass spectrometer, for example, is measuring the upper atmosphere and ionosphere's composition and "weather" for the first time. The goal is to chart connections between the upper atmosphere, where the molecules escape, and lower reaches of the atmosphere that regulate the climate.